A nice bottle or glass of soy milk is something that doesn’t only quench the thirst but is very pleasing to the palate as well. It is a great alternative to milk as well as it is non-dairy and won’t trigger an allergic reaction if you are lactose intolerant. While you can buy commercial soy milks, it’s nice to have the ability to make them at home so you can whip up one whenever you want to drink it. It is actually fairly easy to make your own soy milk, especially with the existence of soy milk makers. If you want to make your own soy milk at home, read until the end of this article to find more buying tips and recommendations on the best soy milk makers to get. If you want to get the most bang out of your buck, you should get familiarized with the important features and factors that usually come with a soy milk maker. Here are a couple of things that you should never forget to keep an eye out on before you buy a soy milk maker to guarantee that you end up with a product that you will enjoy using. Capacity pertains to the amount of water that the machine can accommodate. If you are making soy milk for yourself, then I guess it’s safe to say that a small-capacity soy milk maker can be the best choice for you. 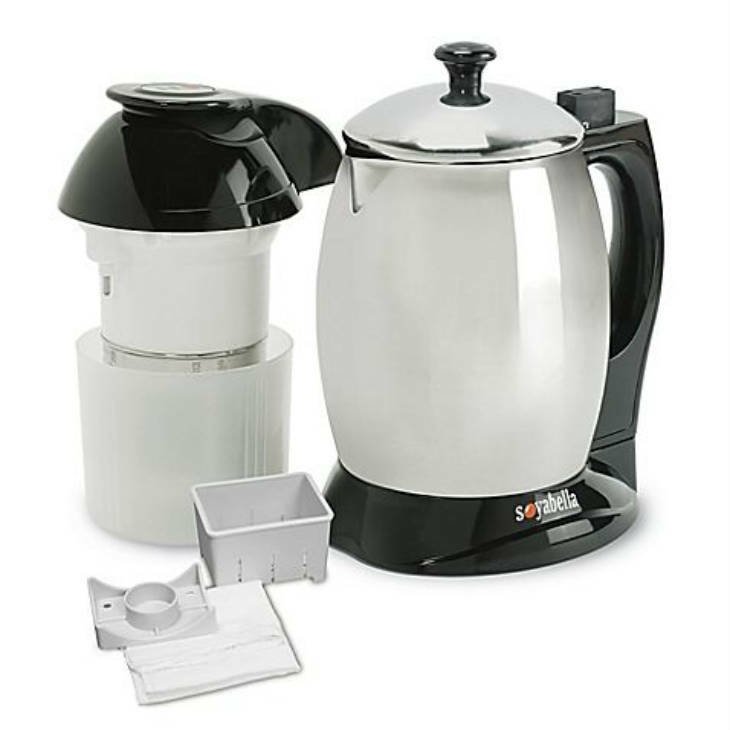 Otherwise, you should choose a soy milk maker that can help you create large batches of soy milk. I myself prefer going with large-capacity soy milk makers because when it comes to soy milk, a glass or two can never be enough. Plus, it’s always great to create a large batch of soy milk that you can store in the fridge for future use. Soy milk makers can either come with plastic or metal interiors. I personally recommend going with soy milk makers that are made with food-grade stainless steel interiors because these ones tend to be safer to use. Creating soy milk requires boiling liquids in high temperatures, which is not really the best kind of cooking method for plastic materials since harmful chemicals from the plastic materials can get attached to your food. What’s more is that stainless steel interiors do not warp over time like the plastic ones. A great glass of soy milk is often made with a filtered soymilk maker. Just like other beverages that require extraction from a certain ingredient, soy milk requires the separation of liquids and pulp that can make the whole beverage have a weird consistency. To reduce your effort when it comes to filtering the soy milk, I suggest you go with a machine that comes with its own filter. Having a machine that comes with a filter will not only lessen your efforts in making soy milk but will lessen the cost for extra materials such as filter bags as well. However, you must be patient with models that come with filters since they can be a bit more difficult to clean. You know what’s great about certain soy milk makers? They can be used for more than making soy milk! Instead of getting a machine that has only one purpose, why not get the most out of your purchase by choosing a machine that can do so much more? 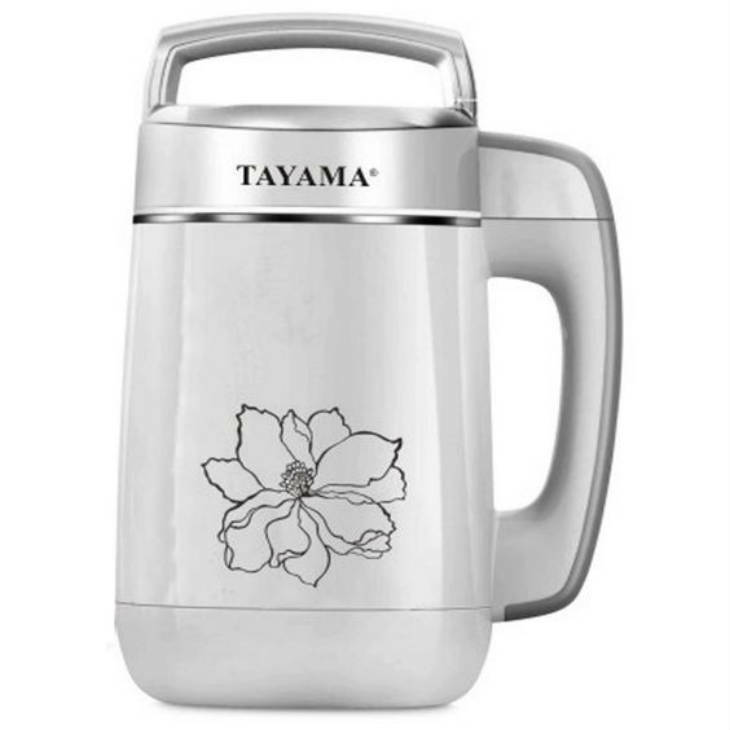 Try to go with a soy milk maker that you can use to create other kinds of beverages as well. Some soy milk makers can help you create different kinds of nut milks, juices, soups, and even oatmeal. However, if you are simply looking for something that would just help you get the job of making soy milk done, do not try to get a machine that comes with unnecessary features since it will only cost you more. Soy milk makers come with a mechanism that grinds dry soybeans in order to make the extraction of flavors easier. If you plan to make soy milk early in the day or late at night or if you plan to make soy milk in a house with napping babies or children, you may want to go with a silent soy milk maker to avoid disturbing anyone’s peace. Another important factor that you need to consider is how quickly your soymilk maker can make soy milk from dry soybeans. Try to choose a soymilk maker that can make soy milk out of completely dry soybeans instead of soaked ones. Soaking beans can require you up to 12 hours of prepping, which is a pretty long. A soy milk maker that can make soy milk from dry soybeans can quickly make you a batch of fresh soymilk within 30 minutes. Unless time isn’t something that really matters to you, or if you’re the kind of person who likes to create large batches of soymilk for storage, then you may be fine with a soymilk maker that only works with soaked soybeans. Take a look at our detailed review below. 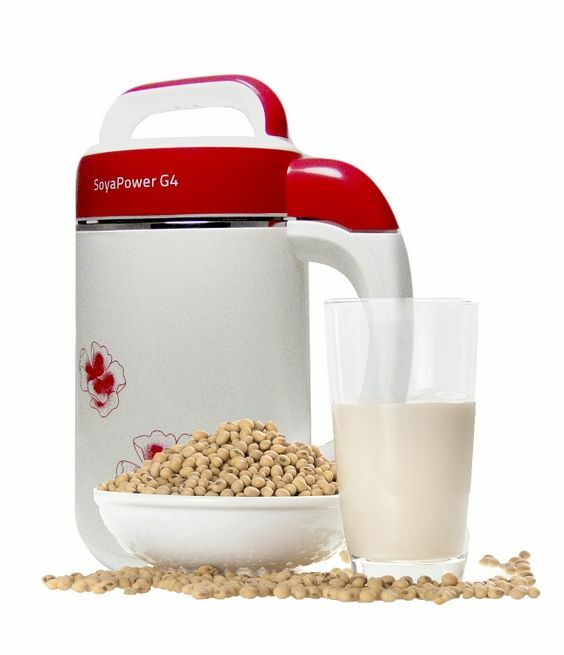 The SoyaJoy Soyapower G4 soy milk maker is one machine that offers advanced features and versatility in the kitchen, making it a machine that any soy milk lover or health buff can surely enjoy. What’s great about this machine is that it comes with a sleek-looking design that will make it easier for you to pair it with other appliances in your kitchen. 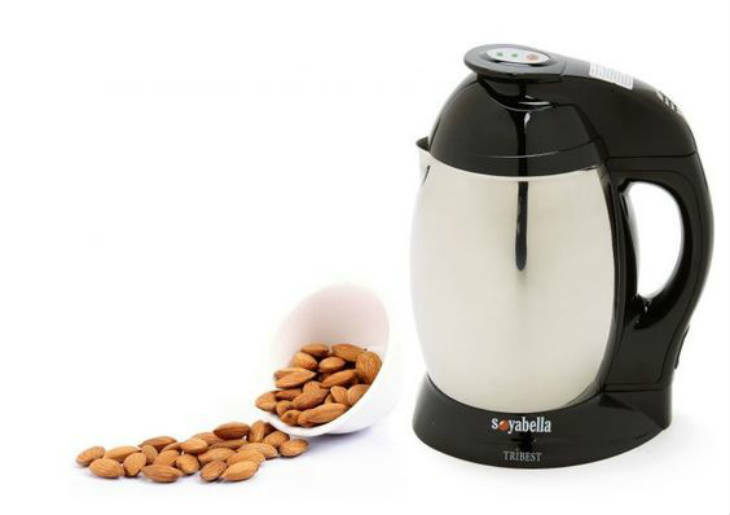 What I like about this model is that despite coming in such a sleek design, it can accommodate and create up to 1.3 liters of healthy and flavorful soy milk. It even comes with a completely stainless steel interior that is ultimately safe to use and easy to clean. This machine is also very versatile. Aside from being a tool for making soy milk, you can also utilize this machine to create other kinds of healthy beverages such as vegan milk, soups, cooked milk, cooked grains, and even a sweet cup of chocolate. Lastly, this interesting machine also comes with an advanced set of features that will allow you to monitor the water levels, temperature, and overall performance of the machine. With its high-tech power controls and overall versatility, I can truly say that this soy milk maker is one of the best in the market as of this year. The Soyajoy G4 maker is one machine that has a very attractive looking design that will make it easily fit in with the current appliances in your kitchen. What I like about this model is that its attractive design has not compromised its overall functionality. This machine is also very versatile that you can also use this machine to create other kinds of healthy beverages such as vegan milk, soups, cooked milk, cooked grains, etc. What’s more is that it can accommodate and create up to 1.7 liters of healthy and flavorful soy milk. It even comes with a completely stainless steel interior that is ultimately safe to use and easy to clean. Another great thing about this machine is its high-tech power controls that will allow you to monitor the water levels, temperature, and overall performance of the machine. 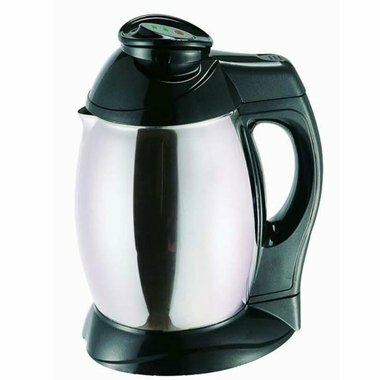 Perhaps the only downsides to this machine is that since it can accommodate almost 2 liters of liquids, it requires a rather large storage space and that it doesn’t come with its own filter. Despite being a rather big piece and the lack of a built-in filter, this soy milk maker is still a great choice if you wish to create large batches of fresh soy milk right at the comfort of your home. Has complete features that can help you make not just soy but other things as well such as soups and almond milk. 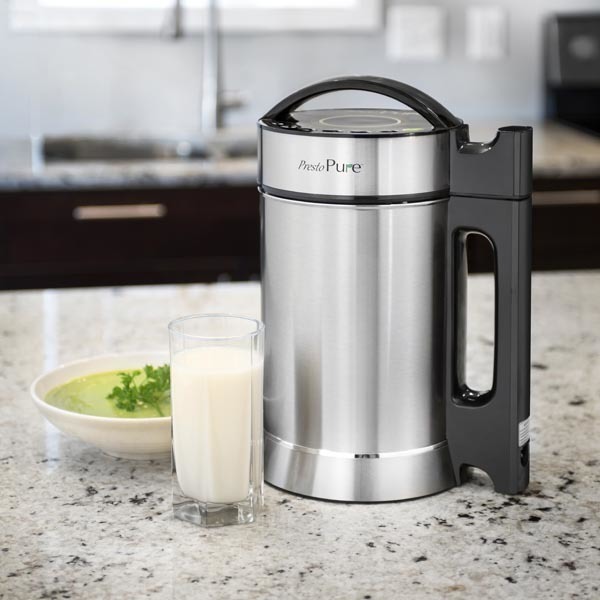 If you want to make about half a gallon of soy milk for your friends and family, this Presto Pure soy milk maker may be the best choice for you. This soy milk maker is only the largest one on the market today, so I really doubt you’ll find one that can help you make more soy milk in one sitting than this. Aside from its large capacity, what I like about this machine is that it is so much more than a soy milk maker. It comes with 7 interesting functions that will let you create all sort of beverages and dishes including juices, soups, purees, vegan milks, oatmeal, porridge, hot chocolate, and more. With this machine at your disposal, you will be able to create healthy milk out of pumpkin seeds, quinoa, hemp seeds, flaxseed, sesame seeds, and sunflower seeds. You can even use it to make rice, coconut milk, and even oat milk. Another thing I liked about this machine is how it comes with a completely stainless steel interior grinding and cooking chamber. It is even backed up with a bottom heater for even cooking of ingredients. Lastly, this machine is completely backed up with a 1-year warranty that you can rely on for parts replacements and technical fixes. 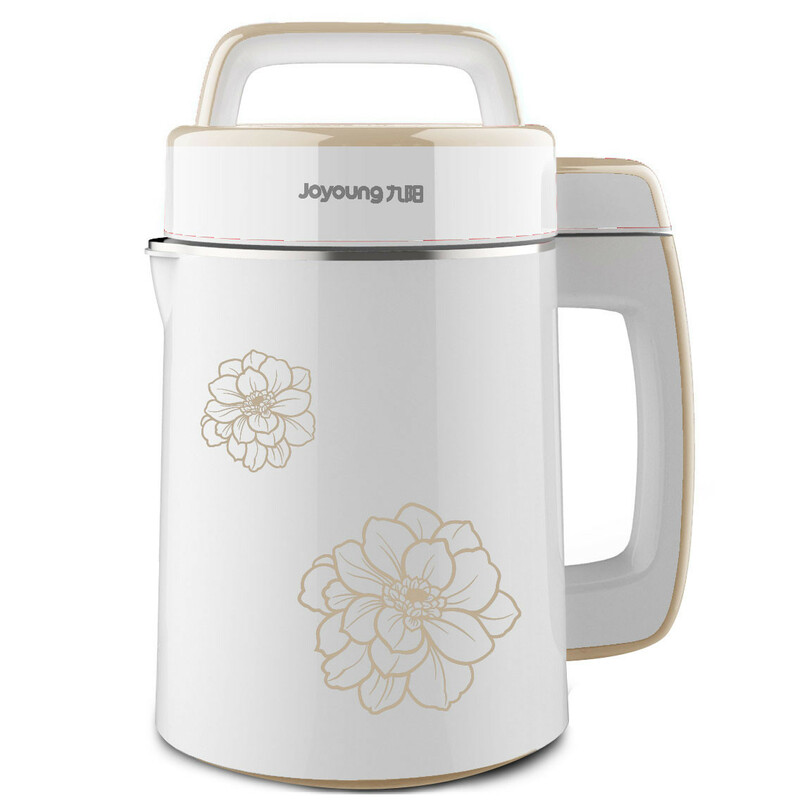 If you consider yourself a tech-savvy person who loves using high-tech machines, then the Joyoung soy milk maker may be the best choice for you. Any tech lover would enjoy using a computer controlled soy milk maker I suppose. This soy milk maker comes with a micro-computer control that will allow you to easily navigate all of its 6 interesting functions. What I like about this machine is that unlike most soy milk makers, this one actually lets you create up to 1.7 liters of fresh soy milk with just a simple press of a button. Another thing I liked about this machine is that it comes with other great features that add to its overall usability. It comes with an automatic preheat features and up to 6 advanced protection functions for added safety. This soy milk maker is also a very versatile machine that will allow you to make fresh milk from other kinds of ingredients such as mung beans, almonds, corn, rice, and more. Lastly, this machine also comes with a pack of tofu coagulant. The tofu coagulant can help you solidify up to 80 liters of 25 gallons of soy milk. This machine is also backed up by a very useful warranty that you can use if you ever encounter any technical issues. This soy milk maker is more expensive but that is to be expected given its many amazing features. It is filterless because it isn’t needed due to its ability to grind soybeans largely. It has a powerful motor that does a great job in grinding soybeans without leaving residues behind. It is completely programmable. You can use the programming functions to tweak the temperature and time settings. 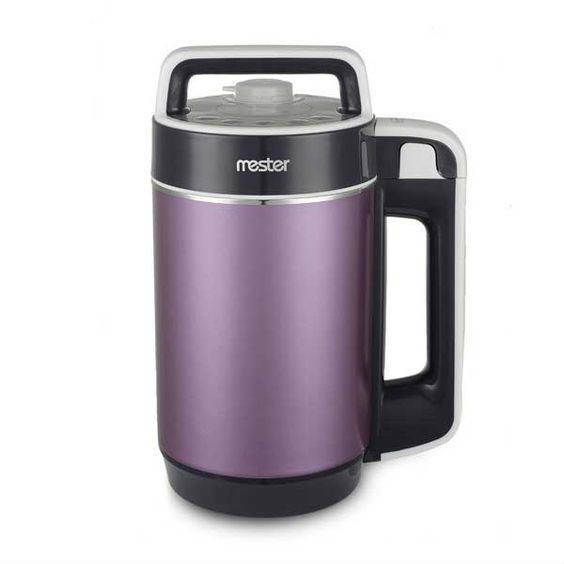 The inside is made from 304 food grade stainless steel that will ensure durable and safe functions. This has complete programmable settings for easier usage. The design is good. It has a nice look to it that will ensure it works seamlessly in your kitchen. The motor is powerful, and it can grind soybeans effectively minus the resides. 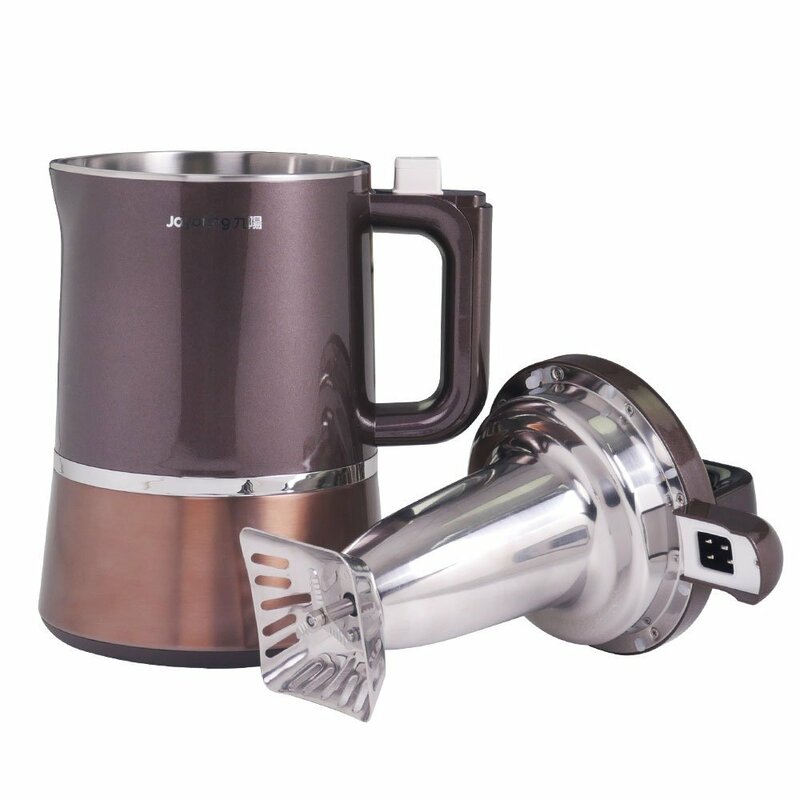 It has warming function that can keep even cooled milk warm again, thereby eliminating wastes. It is more expensive than others. With 1.1 liters of capacity, you can make a big batch of soy milk for you or your family’s everyday needs. It operates at 750 watts of power, so this shouldn’t put too much toll on your electrical consumption. It is unique in the sense that it does not use a net. This allows it more flexibility to make other foods such as soups, porridge and even juices. One of its best features is its Double Emulsification function that allows it to thoroughly grind the beans to ensure that it releases the most nutrients and keeps the natural scent intact. Made from stainless steel inside, this will last you for a long time. The exterior stays cool to the touch, thanks to its thermoplastic components. It has a large capacity that can make soymilk and other foods big enough to accommodate the needs of small to medium-sized families. This soy milk maker features a 3D heating system. It doesn’t have a heating tube but instead distributes the heat evenly throughout the entire body. You will like the modern design of this soy milk maker. The microcomputer control system allows fully automatic operations. It doesn’t come with a filter, so that is one less thing to deal with. Maintenance is easier. The grinding system creates a smoother consistency of soymilk. This unit comes with useful accessories. Some customers had difficulties reaching out to the manufacturing company. It makes soy milk and other kinds of milk from nuts fast. It has an audible signal to let you know once it is done making the milk. 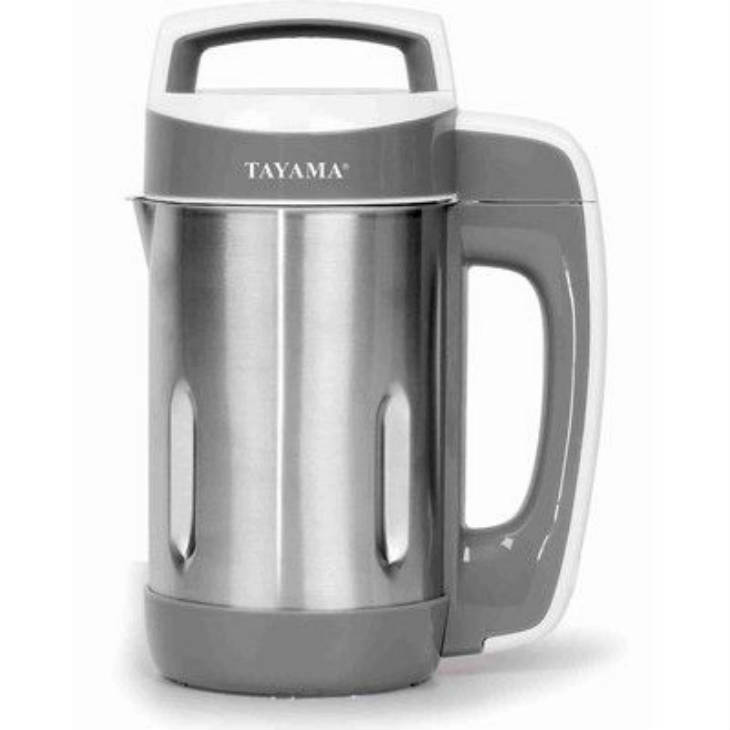 You can make other things such as porridge and soup in this soy milk maker. It offers simple and effortless operations. This unit doesn’t require extra straining. The heating elements are all hidden to prevent accidents. Some said cleaning this unit is a chore. It does come with a cleaning brush to make it easier. It is a bit more expensive than other soy milk makers. This soy milk maker is capable of producing 1 quart of soy milk in just 15 minutes. It has a convenient heating element sensor that effectively monitors the milk being produced to avoid overflowing and overheating. It also checks if the tank is empty. The microprocessor integrated in this soy milk maker guarantees efficient and even results all the time. Your purchase includes a grinding cup to turn your soy milk maker into a coffee grinder. 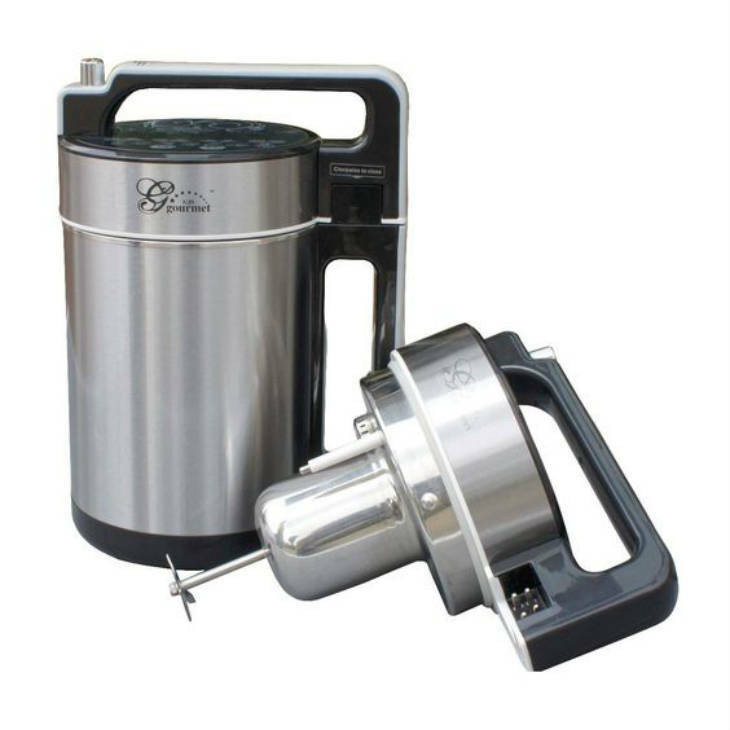 This is an automatic soymilk maker that is easy to use and clean. It makes soymilk in as fast as 15 minutes. The heating element is completely enclosed. It comes with different accessories such as a measuring cup, grinding knife, cleaning pads and brushes and a grinding cup. The heating element comes with sensors to monitor overheating, empty tank and overflow. This can prevent the unit from working unsafely. Can be used to make nut milk as well. There aren’t a lot of negative reviews with this product. 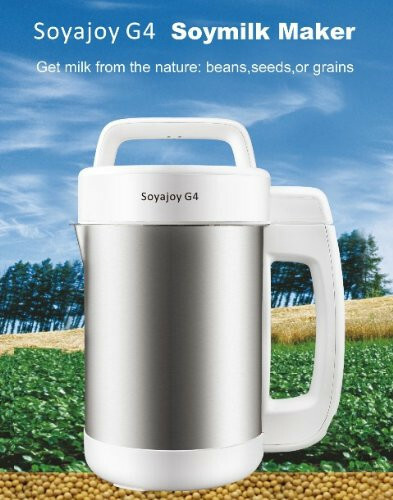 The SoyaJoy Soyapower G4 Soy Milk Maker is an affordable soy maker that has all the functionalities you might be looking for in a soy milk maker. It is versatile, great for those who want a multi-functional machine for their kitchen needs. If you are looking for a soy milk maker that has a bigger capacity, the SoyaJoy G4 Soy Milk Maker won’t disappoint you. This one has a minimalistic design as well so if you don’t like something that stands out too much, this should be a good choice. If what you want is a machine with water sensors, SoyaJoy G4 Soy Milk Maker is the best soy milk maker as it can sense the temperature and water level. Those who have bigger soy milk-making needs, the Presto Pure IAE15 is the best option for you with its 1.9-liter capacity. Since it has a bigger capacity, it also has a bigger footprint so if you don’t mind having something that might take up more space in your kitchen, you will be happy with this product. The Joyoung CTS-2038 is one of the most advanced soy milk makers because this has computerized functions. Because it is computerized, it has more features that will allow you to get the best settings you need. Get this if you are looking for something more high-tech. If you are looking for a soy maker with all the bells and whistles, the Joyoung Soy Milk Maker DJ13U-D988SG is the best choice for you. It is the most expensive one in this list but has programmable features that make soy making a lot easier. 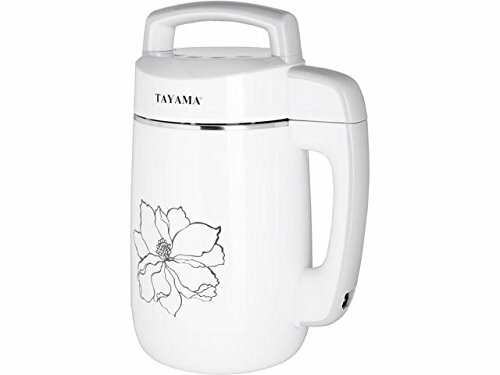 The capacity of the TAYAMA DJ-15S Multi-Functional Soy Milk Maker makes this an ideal choice for people who need to make big batches of soymilk. It is versatile enough to be used as a porridge or soup maker. It creates the smoothest consistency of soymilk as well. 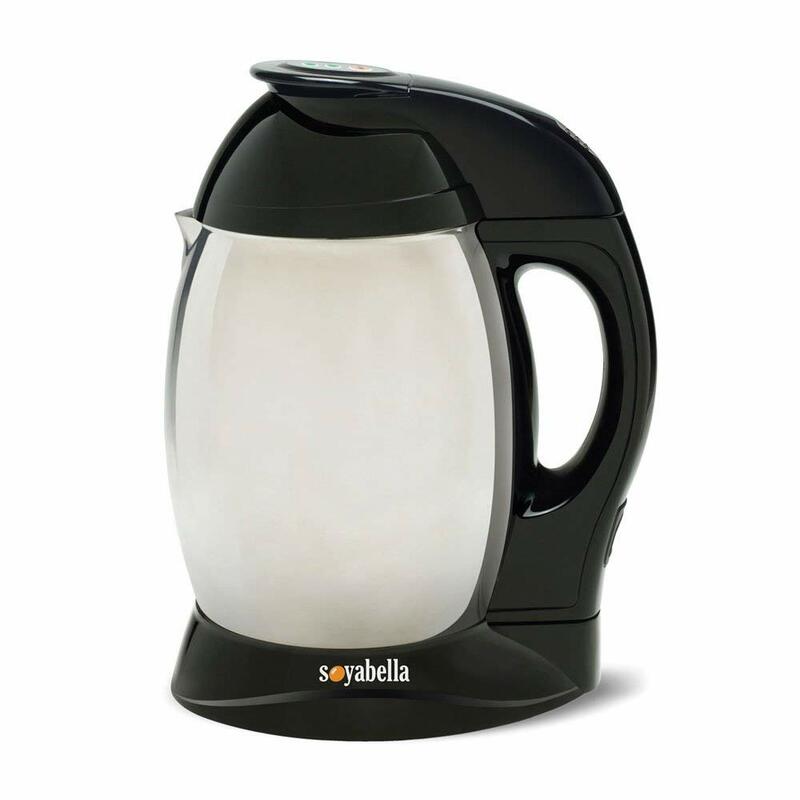 You don’t need to wait for a long time for your soy milk with the help of the Tribest Soyabella SB-130 Soymilk Maker. It creates delicious soy milk and milk from nuts in a short period of time, so you can enjoy your dairy-free milk in no time at all. With the accessories included, it can also double as a coffee grinder. There’s a reason why the Miracle Exclusives MJ840 Automatic Soymilk Maker doesn’t have negative reviews yet. It has a lot of reliable features, that’s why. It works fast in creating soymilk and can be used for other purposes as well. But perhaps its best advantage is its sensor that detects if there is overflow, overheating and an empty tank. Check out our homepage for more kitchen and home product recommendations. Read reviews and buying guide of appliances you can add to your cooking arsenal.